Amaryllis potted gift kits are an easy way to grow beautiful Amaryllis. Cheaper kits often have young bulbs that will produce just one flowering stem. More expensive kits, often have larger bulbs that will produce two flowering stems, or offer a more exotic selection of varieties. Either way, the bulb in your potted gift kit, has been specially prepared to bloom within a few weeks of planting! Whether you buy a kit, or receive one as a gift, with good care you will be able to rebloom your Amaryllis year after year! Our website will show you how. See our Amaryllis Bulb Care Guide for more detailed information on caring for your Amaryllis potted gift kit. A maryllis(Hippeastrum) are easy to grow from kits. Whether you receive one as a gift, or buy your own, you'll have everything you need to grow your own beautiful amaryllis! Kits are usually sold between fall and winter. The bulbs are ready to bloom within a few weeks of being purchased. Kits generally contain 1) a bulb, 2) a container or pot and 3) a potting mix. Its important to moisten th e mix thoroughly before planting your bulb. These are usually peat-based mixes that are difficult to get wet. We suggest you empty the mix into a large plastic bag, or small bucket. Then add water slowly, a little at a time, while stirring the mix continuously with a stick. This will help moisten the mix thoroughly. Important: Make sure mix is moist and not too wet. Once the water has been absorbed(leaving the mix overnight helps) it will be easier to pot your plant. Plant the bulb so that the neck is pointing upwards. The neck, and about 1/3 to 1/2 of the bulb should be exposed as shown below. At this stage, the mix should be kept just moist, as the bulb does not yet have any roots and will rot with excessive moisture. In a few weeks, as the flowering stem emerges, you can increase the amount of water. 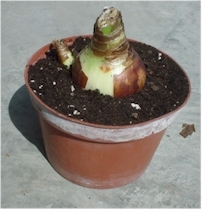 Here is a correctly potted Amaryllis bulb. Up to half the bulb should be exposed above the soil surface. Be careful not to get water into the neck of the bulb when watering. The soil should be tamped down firmly so that the bulb is steady. Place your pot in bright indirect light where temperatures are about 65-75 degrees. In a few weeks, or less, a flower bud should emerge!